Back to: Get started with Style Matters now! 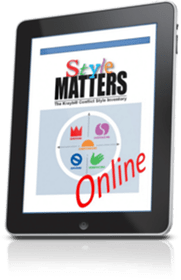 Get started with Style Matters Online! Answer 20 questions online and get immediate access to a six-page report describing your conflict styles profile, with detailed suggestions about how to strengthen your responses to conflict. Includes tutorial for indepth study. Print out or email your Score Report with ease. Simple graphics and clear text take you quickly and effortlessly through the fundamentals of conflict styles. To order for a group, see additional options in Ordering as Trainer in top menu above. Six pages of personalized advice. Take a short online survey and get an immediate report, packed with no-nonsense feedback. Our software analyzes your scores, highlights your strengths, alerts you to things to watch out for, and gives specific suggestions for improving your conflict style. Storm Shift assessment guides you in stress. Does your behavior change significantly as things escalate from disagreement to high intensity conflict? This can confuse others and reduce trust. Learn your patterns and manage your Storm Shift! Interactive tutorial lets you manage learning. Includes all the content covered in most training workshops: basics of the five styles, strengths and weaknesses of each, and how to work with people whose styles differ from yours. Practical tips show you next steps. Get specific suggestions you can immediately use in your relationships, based on your scores. Go beyond nice, be strategic! Online resources put expertise at your fingertips. Get new ideas on anger management (How to express it constructively), apology (Why apologizing too soon can make things worse), conflict resolution, culture and conflict, training, and more. Connect to resources and people working on issues you care about. Social networking helps you share what you choose. Connect on issues of conflict management on Facebook LinkedIn, Twitter, and Google+. Share your conflict style preferences with people close to you. Conflict is a social experience; conflict management should be as well. Survey questions that work well for people from one culture may seem pointless in another. Style Matters puts you at ease by letting you choose the context of the questions you answer. We'll refund every penny if you don't get new insights on your conflict style. Gain valuable new insights about yourself and your options in conflict or we'll refund your money in full. No explanation required.